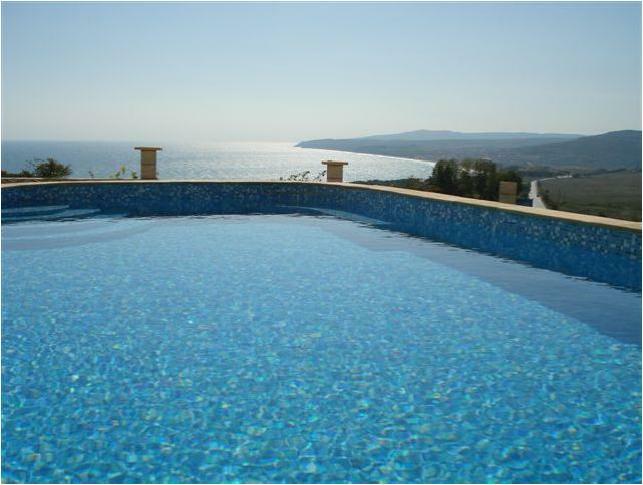 Enjoy your Bulgarian holiday in this fantastic new and contemporary furnished sea-view villa which consists of 4 bedrooms, three bathrooms, private gardens with large swimming pool and sun terrace. On the ground floor you’ll find a large open plan living and relaxation area with feature fire place which leads out on to the patio with sun-loungers, garden table chairs and that all important swimming pool. In the corner of the garden you will also find a Greek-style Oven which is perfect for barbecues. There is also an outdoor poolside shower to keep you refreshed. The middle floor is the main open-plan living and dining area looks out over the sunny garden and pool areas, and the beautiful Black Sea. Windows run the entire width of the house with large sliding doors leading out onto a huge terrace with outstanding panoramic sea views. The large dining table accommodates 8 adults comfortably. For larger groups the sofa in the living area can be converted to a double-sized bed to sleep an extra two guests. There is cable TV in the living room with a choice of English-language channels. There is one double bedroom on the middle floor, with an adjacent bathroom. As with all the bedrooms in this house, there is a sea-view terrace and air conditioning. Additionally on this floor is a laundry room with washer/dryer and ironing board. On the top floor are three large bedrooms, all air conditioned and with sea-view terraces. The master bedroom has it’s own en-suite bathroom with shower. The other two bedrooms (one double, one twin) share a family bathroom with bath and shower. One great benefit of living in Bulgaria is that all this fresh organically grown local produce is available from the shops which also stock any basics you might have run out of, from toilet tissue, toothpaste and washing powder to eggs, milk, butter, wine and beer. And don’t worry about not speaking Bulgarian. The Bulgarians are a very friendly people and with several English families having bought homes in the area they are very good at communicating without language. Although a car is not necessary we would recommend it to enjoy the area to the full. Traffic in this part of the Black Sea coast is very light and traffic jams are unheard of. (Pride rentals can supply you with details of very good car-hire rates) To give you a small flavour of the area, all of the following can be reached within a maximum of 45 minutes from the villa. The villa is set in Balchik villa zone and surrounded by white gentle rolling hills of the Bulgarian coast line and yet it’s just a few minutes away the resorts of Albena, Golden Sands and Bulgaria’s second city, Varna. 45 minutes away. Bulgarias second largest city and possibly its most atmospheric. It offers a fabulous beach separated from the city by a wooded seaside park bursting with people and festivals throughout the summer and a wonderful place for evening strolls. In the park you will find the Natural History Museum and an Aquarium, introducing the plant and animal life of the coast, as well as a Dolphinarium. The city itself boasts numerous bars, cafes and restaurants offering everything from Macdonalds to 5-star cuisine. Shopping in Varna is superb too with leather goods, shoes and embroidery amongst the best buys. 15 minutes. Renowned for both its arts and crafts and the quality of the agricultural produce grown in the surrounding fertile plain. Being a genuine working town, prices in Dobrich are reckoned to be amongst the lowest in Bulgaria. The town centre is peppered with cafes and restaurants offering good quality fare at amazingly low prices. Old Dobrich is a small open-air museum located in the centre and houses about 30 workshops where craftsmen practice their skills. You can see workshops for pottery, furriery, traditional costumes, traditional instruments; woodcarving, coppersmiths, goldsmiths and many more. 5 minutes. A picturesque old town nestling below weathered white-chalk cliffs and home to the Summer Palace of Queen Marie - a collection of laneways, watermills and glorious gardens. And with its outdoor restaurants lining the seafront in the old port, Balchik is well worth a visit in the evenings too. 20 minutes. A modern resort situated on a long sandy stretch and the most modern resort along the Bulgarian coast. The resort is rich in tennis courts, swimming pools, and children’s playgrounds and tourists can rent bikes, cars, cutters, sail-boats, yachts, waterwheels and jets, or even saddle up and take a horse ride. 30 minutes. Famous for its nice golden sand and long beaches, this is the largest resort on the Northern Black Sea coast, with richly wooded hills and clear blue sea. Golden Sands has wonderful conditions for recreation, entertainment, sport and spa treatment. It is a paradise for children and has been awarded the prestigious Blue Flag prize several times.